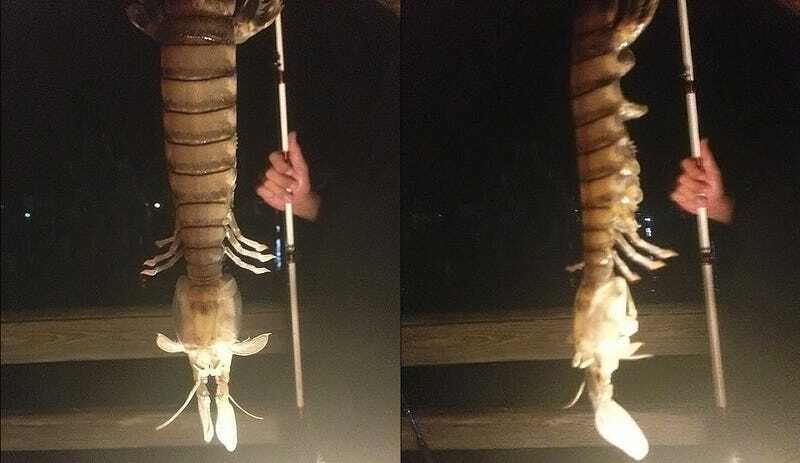 A fisherman caught this monstrous 18-inch-long creature while fishing from a dock in Fort Pierce, Florida. Scientists say it could be a rare kind of Mantis Shrimp but further analysis needs to be conducted in order to determinate what the hell is this mutant monster from hell. Mantis shrimp or stomatopods are marine crustaceans, the members of the order Stomatopoda. They may reach 30 centimetres (12 in) in length, though in exceptional cases have been recorded at up to 38 cm (15 in). Around 400 species of mantis shrimp have currently been described worldwide. So this specimen is three inches bigger than the usual individual. No more details have been disclosed. And yes, obviously the perspective in the photo makes it look impossibly gigantic, but 18 inches is still amazingly huge. I just want to grill it and eat it.